Essentially the more it is debated what the Bank of England can do to get a recovery, the less it appears as if the Chancellor is responsible for the current state of the economy. I think in practical political terms this is correct. However it should not be so: the Chancellor and the Treasury set the MPC mandate. There are three key points here. My conversations with other MPC members are fully consistent with this view. Second, because we have had a series of positive shocks to the Phillips curve, UK monetary policy has not been as expansionary as it should have been because it was, and is, constrained by the 2% target for consumer price inflation. That has become increasingly clear over the last few years. Interest rates were almost raised in early 2011. Third, the Chancellor had, and has, both the formal power, and the political ability, to change this. He might have been cautious about moving to a nominal GDP levels target, but there were less radical options that would have helped the UK economy. The most obvious was to move to a dual mandate: following what the US Fed does can hardly be thought of as dangerously radical. He could, as I have suggested before, change the inflation measure being targeted from consumer price inflation at 2% to nominal earnings at 4%. Controversial, yes, but part of being a good Chancellor is to make bold moves when conventional policy is not working. OK, rant over. What I really want to say concerns nominal GDP targets. In her post, Stephanie Flanders gives the following reason why she thinks a nominal GDP levels target will not be adopted by the Chancellor. “will [voters] really ever believe that a government is going to withstand years of well above, or well below, target inflation, simply to get back to a particular, fairly arbitrary path for the cash value of the economy that was laid down by the folk who were in power before them? The general view in Number 11 is that the answer to that question is no. This puts into ordinary language what macroeconomists call the problem of time inconsistency. Suppose, for example, we had before the recession a target for the path of consumer prices, and not its rate of change. As everyone knows, for most of the last few years UK inflation has been above 2%. With a price level target, the Bank would now be raising interest rates for sure, because it would have to achieve years where inflation was below 2% to get back to target. Bygones would not be bygones. Is it credible that policy makers would do that? More important, would voters allow them to do that? Now a nominal GDP target would not suffer from that specific problem, because the recession goes the other way. But in other circumstances a similar problem could arise. Suppose we had an unexpected boom, where the central bank cannot prevent nominal GDP exceeding its target path. It then is required not just to get the growth rate of nominal GDP back to desired levels, but to reduce it further to get back to the target path. I think Stephanie Flanders is right that selling that policy would be difficult. However that does not mean we should not do it. Committing to doing it may bring significant benefits, as Michael Woodford has consistently argued. What it does mean is that having a formal target could be very useful. Not, as macroeconomists typically put it, to stop central banks reneging on the policy. Instead, to protect central banks from politicians and voters when the bank sticks to the policy. I think in this respect formal inflation targets are rather different from levels targets (whether its price level targets or nominal GDP levels targets). In a recent post I was skeptical of the arguments for why formal inflation targets might be useful, particularly if you had a credible central bank. I prefer the less formal dual mandate of the Fed to the formal inflation target of the MPC. As I noted at the start of this post, formal inflation targets can do considerable harm, whereas their benefits in preventing inflation bias are I think overrated. But the time consistency problem with levels targets is in my view much greater, and so the usefulness of formal targets also becomes greater as a result. Let me put the point another way. Delegation works best when the objectives of the policy are clear. Keeping inflation and unemployment low are uncontentious, as is (nowadays) the idea that there are limits to how low unemployment can be pushed without compromising inflation. So delegating to a central bank that tries to keep inflation and unemployment low can work without hard wiring these objectives by using formal targets. Targeting the price level, when what you care about is inflation, is much less intuitive, and therefore potentially contentious. For that reason, it is a good idea to not leave this issue to the discretion of central bankers, but to formalise it as an instruction to central bankers - for their sake as much as ours. So, if we are looking for the optimal monetary policy, I think the informal dual mandate of the Fed dominates a formal inflation target, but whether it dominates a formal price level or level of nominal GDP target remain open. Which means the new Bank of England governor should ask the Chancellor to change something. However, as I said at the start, the Chancellor really should have changed something already. An attractive way to give a broad sweep over the history of macroeconomic ideas is to talk about a series of reactions to crises (see Matthew Klein and Noah Smith). However it is too simple, and misleads as a result. The Great Depression led to Keynesian economics. So far so good. The inflation of the 1970s led to ? Monetarism - well maybe in terms of a few brief policy experiments in the early 1980s, but Monetarist-Keynesian debates were going strong before the 1970s. The New Classical revolution? Well rational expectations can be helpful in adapting the Phillips curve to explain what happened in the 1970s, but I’m not sure that was the main reason why the idea was so rapidly adopted. The New Classical revolution was much more than rational expectations. The attempt gets really off beam if we try and suggest that the rise of RBC models was a response to the inflation of the 1970s. I guess you could argue that the policy failures of the 1970s were an example of the Lucas critique, and that to avoid similar mistakes macroeconomists needed to develop microfounded models. But if explaining the last crisis really was the prime motivation, would you develop models in which there was no Phillips curve, and which made no attempt to explain the inflation of the 1970s (or indeed, the previous crisis - the Great Depression)? What the ‘macroeconomic ideas develop as a response to crises’ story leaves out is the rest of economics, and ideology. The Keynesian revolution (by which I mean macroeconomics after the second world war) can be seen as a methodological revolution. Models were informed by theory, but their equations were built to explain the data. Time series econometrics played an essential role. However this appeared to be different from how other areas of the discipline worked. In these other areas of economics, explaining behaviour in terms of optimisation by individual agents was all important. This created a tension, and a major divide within economics as a whole. Macro appeared quite different from micro. A particular manifestation of this was the constant question: where is the source of the market failure that gives rise to the business cycle. Most macroeconomists replied sticky prices, but this prompted the follow up question: why do rational firms or workers choose not to change their prices? The way most macroeconomists at the time chose to answer this was that expectations were slow to adjust. It was a disastrous choice, but I suspect one that had very little to do with the nature of Keynesian theory, and rather more to do with the analytical convenience of adaptive expectations. Anyhow, that is another story. The New Classical revolution was in part a response to that tension. In methodological terms it was a counter revolution, trying to take macroeconomics away from the econometricians, and bring it back to something microeconomists could understand. Of course it could point to policy in the 1970s as justification, but I doubt that was the driving force. I also think it is difficult to fully understand the New Classical revolution, and the development of RBC models, without adding in some ideology. Does this have anything to tell us about how macroeconomics will respond to the Great Recession? I think it does. If you bought the ‘responding to the last crisis’ narrative, you would expect to see some sea change, akin to Keynesian economics or the New Classical revolution. I suspect you would be disappointed. While I see plenty of financial frictions being added to DSGE models, I do not see any significant body of macroeconomists wanting to ply their trade in a radically different way. If this crisis is going to generate a new revolution in macroeconomics, where are the revolutionaries? However, if you read the history of macro thought the way I do, then macro crises are neither necessary nor sufficient for revolutions in macro thought. Perhaps there was only one real revolution, and we have been adjusting to the tensions that created ever since. I would not be the first to observe that there is a potential conflict between George Osborne’s role as Chancellor and his deep involvement in Conservative Party election strategy. The fact that this is often said does not mean it is real - it could just be a story told by those commentators who are themselves fixated by the battle between political parties. However there are two major areas where the Conservative part of the coalition government seem to be putting perceived election advantage ahead of prospects for the UK economy: immigration and Europe. Jonathan Portes has clearly described the contradictions between an economic philosophy that stresses the importance of deregulation and a flexible labour market, and tight restrictions on the ability of firms to hire who they want if they happen not to be UK residents. In addition, making it difficult and risky for foreign students to study in the UK directly hits the exports of the education sector, which I have talked about before. Now perhaps immigration control is so deeply embedded in conservative philosophy that it trumps economic liberalism, or helping increase UK’s exports. Or alternatively, immigration is seen as a vote winner and so any damage that this will do to the UK economy can be set aside. The Prime Minister has now finally made his commitment to hold a referendum on EU membership in four years time. This has been widely interpreted as a move to both appease the anti-EU wing of his party, and to stop the drift of voter support to the UK Independence Party. The opposition has claimed that this will create damaging uncertainty, and on this occasion they are almost certainly right. We do not need to just take the word of business leaders on this. A number of studies (e.g. here and here) have recently highlighted the role of uncertainty in influencing the macroeconomy. There can be little doubt that decisions by multinationals or export orientated domestic firms on where to locate or expand production are heavily influenced by whether countries are inside or outside trading blocs. Given the real risk that a majority in the UK referendum will vote to leave, investment decisions are likely be postponed at best, and diverted elsewhere at worst. Neither is what the economy needs right now. The economic benefits of promising a referendum on EU membership in five years time are hard to see. It is also hard to imagine why the Prime Minister had to make such a commitment, besides the political imperatives of Party unity and keeping votes. Which brings me to the potentially conflicted Chancellor. Ministers are meant to represent their portfolio - and most of the time the complaint is that they do this too much, with too little regard to wider interests. Again the cynic might say that is natural enough, because their own personal political capital is bound up with the perceived success of that ministry. So a Chancellor who was totally focused on being a Chancellor, in a situation where the economy was doing badly, would be banging the table against anything that put a recovery at risk. Now perhaps George Osborne has been lobbying hard against immigration controls, and against the referendum commitment, although if he had I suspect we would know about it. A more plausible story is that he shares the Prime Minister’s view that on these two issues at least political advantage outweighs economic interests. But in making this judgement, he is acting as Conservative Party strategist and not as the UK Chancellor of the Exchequer. In my last post I outlined why a world in which the government owned assets rather than issued debt might be better, because it would allow us to reduce distortionary taxation. There is an alternative argument that appears to come to a completely different conclusion, and that is what I want to talk about here. It is the argument that we need more safe assets. As the safe assets argument relates directly to the recent financial crisis, it is also rather more immediate in focus than questions about what we should do about debt in the very long run when the recession is over. Some aspects of this argument are not contentious. Government debt is safer because government has a unique ability to generate revenues to fund interest payments (taxation), and crucially it has a central bank behind it that can deal with panics. Obviously there are limits, and I’ll assume here that the government remains with those. One response to the point that the financial sector failed to create its own safe assets, and that this led to the crisis, is that that sector should be better regulated. However, as Ricardo Caballero points out here, while a (well regulated) financial sector may be able to successfully handle micro risk, it will always struggle with macro risk. However there is still plenty of scope for disagreement on the ability of the private sector to manufacture safe assets: see for example here and here. More problematic is the idea that government debt and private debt are complements rather than substitutes. In macro there are two benchmark approaches to this issue. (1) The Ricardian model says that government debt does not crowd out productive capital: it is just deferred taxation, and so it creates its own demand. Consumers will not hold less private assets (like equities) just because there is more government debt around – instead they will just save more. (2) The OLG (overlapping generations) model says government debt will crowd out private debt. Consumers hold assets to fund their retirement, and if the (risk adjusted) returns are the same, then they are happy to replace equity with government debt. Less equity debt means less productive capital, which will push up interest rates, but while this will mitigate any crowding out (if it increases savings), it will never altogether prevent it. Unless there is too much productive capital in the world (which few believe), crowding out productive capital is bad for society because we produce and consume less. This is a second reason, besides distortionary taxation, why government debt should be radically reduced. In neither of these frameworks is government debt helpful in facilitating the creation of private debt. However this may just reflect the very simplistic view of the financial sector in macro. In reality collateral is all important in enabling the creation of risky financial assets. (One of the causes of the financial crisis was that large financial institutions had too little of it, and regulation is now forcing them to have more.) This idea is completely missing from the OLG framework. A recent paper by Gourinchas and Jeanne which has received some attention online (e.g. here and here) suggests how the two views might be reconciled. (Non-economists can probably skip this paragraph, particularly as I am extrapolating from their Section 3 model in a way that may not be justified.) Default risk can be an increasing function of the ratio of private to public assets, because of this collateral effect (for some evidence, see here). Their paper suggests that, in general equilibrium terms, less default risk may increase the risk free real interest rate in an OLG type framework. So if increasing public debt reduces default risk, it may also encourage additional saving by raising the risk-free real interest rate. However (and this is the speculative bit on my part), unlike the basic OLG case, this higher risk-free rate may be associated with a lower risky rate, because the risk premium has fallen, so this additional saving may fund both extra public debt and additional productive capital. It seems to me, as we academics like to say, that this is a promising avenue for future research. Yet two (additional, and perhaps related) things remain unclear to me. First, is producing government debt the most efficient way for the government to reduce risk? Caballero in the piece referenced above suggests it may not be. Second, is the distinction between net and gross debt important here? Suppose a government did reduce its long term need to raise taxes by reducing its net debt position, but did this by buying assets rather than reducing its gross debt. Obviously by holding private sector assets it increases its exposure to macro shocks, but it retains its ability to cover those through either taxation or money finance, so its gross debt may remain safe. (Some of the commentary I have seen suggests it could just hold more cash at the central bank, but this does not seem tenable if we think, as seems appropriate here, about a consolidated government and central bank.) Could we this way have the best of both worlds in the long run: fewer distortionary taxes but also plenty of safe assets? In a recent post I had an imaginary interviewer asking “But surely no government can keep on borrowing more forever.” To which my suggested reply was “Of course not. But the right time to cut government borrowing is when the economy is strong, and the cost of borrowing is high.” This prompted a little discussion in comments about the long run desirability or otherwise of government borrowing. What I have to say here is only about the long run, and has no immediate relevance while we are still in a recession. I have to stress here that by long run, I really do mean very long run. It is the period to which Keynes dictum applies. Why? One of the most robust ideas when it comes to government debt is that it should adjust very slowly, and absorb any shocks coming from the economy along the way. The reason, which is just tax smoothing, I have discussed at greater length here. Which prompts an obvious question: if any long run debt target is meant to be achieved in centuries rather than years or decades (I did say very long run), do we need to worry too much about it? This turns out to be a rather good question. What little literature there is on this issue contains the ‘steady state random walk debt’ result. What this means in ordinary English is that it can be optimal to have no target for government debt. Perhaps a better way of putting it is that the costs of adjusting towards any target outweigh the long run benefits of achieving it. Imagine a recession raises debt. To get debt back down we need to increase taxes in the short run by a lot. Alternatively we could make no attempt to reduce debt, but instead just raise taxes by enough to pay the interest on the extra debt. That will mean raising taxes by less, but having to do so forever. So in one case (debt targeting) taxes rise by a lot in the short run, but not at all in the long run, while in the other (debt accommodation) taxes rise by a little forever. You might think the second (debt accommodation) alternative must be worse, because the pain is ever lasting, but you would be forgetting about discounting. Which is better depends on the size of the discount rate relative to the size of the real interest rate. It turns out that if the two rates are equal, the second alternative (debt accommodation) is optimal. And it just so happens that in our benchmark macroeconomic model, where agents care about their children and so effectively live forever, the two rates are indeed equal. Obviously this ignores default, which might put an upper limit on debt. There are other, potentially important, caveats, which I have discussed elsewhere. However the basic result relies on the exact equality of the discount rate and real interest rate. If the real interest rate is even slightly greater than the discount rate, and there are good reasons for thinking in the long run that it might be, then it makes sense to adjust to a debt target, although the adjustment should be very slow. So what should this target be? Norway is a special case, of course, but note Australia, Denmark, Finland.... Now I do not know much about the reliability and comparability of these net debt figures, but Australia’s gross debt was less than 15% of GDP in 2007, and both they and New Zealand had a clear policy to reduce debt towards zero, although for different reasons than the one suggested above. Turning government debt into assets may seem an impossible goal now, and it is a goal we should be ignoring in a recession. However once the recession is over, and given that adjustment should be very very slow, it is not so obviously a ridiculous target. If we combine incredibly slow adjustment with an incredibly ambitious target, we might end up with something reasonable – which is to aim for a gradually falling debt to GDP ratio once the recession is over. There are lots of qualifications I would want to throw at this result, but this post is already long. (Those who are interested can read this working paper.) The only one that I have come across which completely overturns this idea is the literature on safe assets, but that definitely requires another post. So let me end instead with an amusing (at least to me) little story. I was recently giving this working paper in a UK economics department. One of the department’s members is a well known and for me inspirational macroeconomist, but notoriously right wing. At first he liked the message of my paper, which was that government debt should come down. Until, that is, he saw where it was leading – to an economy where the government owned a large proportion of assets, and therefore inevitably a large proportion of the capital stock. I think this had unfortunate resonances for him! I would not bother with this if it was not for two things. First, Andrew Sentance was on the Monetary Policy Committee, and his persistent warnings then and since that CPI inflation would be higher than expected have been largely right. Second, the factors that have been helping to keep CPI growth high – commodity prices and fiscal austerity – are not obviously about to disappear, so the Bank of England may still be having to explain why they are ‘ignoring’ above target inflation through 2013. There is a genuine puzzle about why the influence of the recession has not dominated the impact of these commodity and fiscal effects. Paul Krugman stresses the role of wage rigidity. My own pet theory for the UK is the influence of the financial crisis, but that is for another post. What has to be laid to rest is the idea that we are about to experience the 1960/70s all over again. Have a look at this chart. 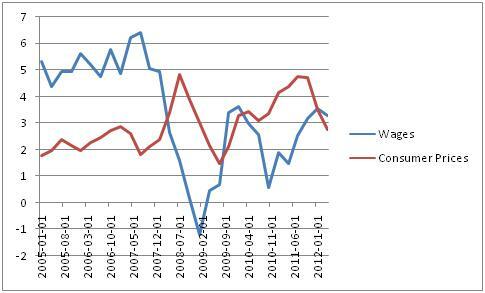 It shows UK wage and consumer price inflation over that period. 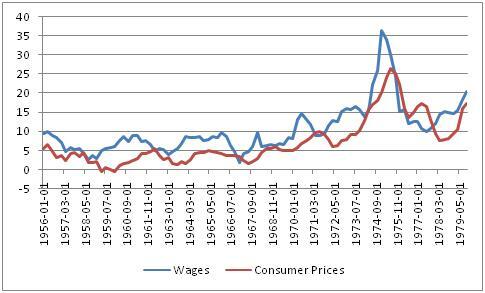 For nearly every quarter before the inflation peak in 1974 it shows wage inflation above price inflation. We do not need to worry about whether one series leads the other as inflation increased – we can just say that both measures of inflation rose together. Hence the phrase ‘wage price spiral’ to describe what happened over that period. Now look at the same series since 2005. I can put the same point another way. If the Bank of England had been given a target for wage inflation as well as its price inflation target, that target would probably have been 4%, reflecting the normal (pre recession) divergence between the two series. If it had only been given a 4% wage inflation target (and there is no clear reason why this should not have happened), then given the numbers above I assume Andrew Sentance would be complaining that the Bank of England had been doing too little to stimulate the economy. This just shows the danger of having a mandated target for just one inflation measure that I talked about here. I suggested in a post a month back that if the Chancellor really wanted to stimulate the economy, he should replace the Bank’s 2% CPI inflation target by a 4% average earnings target. He has the power to do that today, and does not need to wait until the new Governor takes over. But the broader point is that any suggestion that current tolerance of above target inflation is leading us back into the 1970s is about as realistic as a world with dragons. Compensation of employees, source OECD via FRED. It is a real shame that the ONS website is not as user friendly as FRED. Is there a case for inflation targets? The UK versus the US. One of my projects for the year ahead is to come off the fence (one way or another) on nominal GDP targeting. As an experiment, I’ll try and track my progress on this project with blog posts, although only if my thinking might be interesting to others. It is going to be a long process, because there is a lot involved: levels vs rates of change, GDP deflator vs CPI, nominal GDP versus its price component, and uncertainty about the natural rate to name some of the most obvious issues. However there is also another issue that may be just as important, and that is whether we need targets at all. In this post I just want to think about this last issue in relation to inflation targets, and not any other kind of target. An obvious way for a macroeconomist to approach this is to imagine a world in which the central bank acts in society’s best interests, and has as good an idea as anyone else what those interests are. (The policy maker is benevolent, and knows the appropriate measure of social welfare to maximise.) Actually, for both the US and UK I do not think that is such a bad place to start. Let’s also suppose, as is standard, that society’s best interests involve getting inflation close to some desired level, and getting the output gap close to zero. Call this a dual mandate if you like. In such a world, why impose a target on the central bank? In other words, why do what is done in the UK rather than do what is done in the US? By target, I mean something the central bank is required to try and hit. I am not talking about the central bank’s communication strategy. I take it as given that it is a good idea for the central bank without targets to be transparent about what its goals are, including what it thinks the desired inflation rate is. That is why this is effectively a comparison between the UK and US where in both cases transparency is fairly high. The standard academic story involves time inconsistency and inflation bias. (Those familiar with this can skip the rest of this paragraph.) Essential to the inflation bias story is that a positive output gap (output above trend) is better for society than a zero output gap, for given levels of inflation. If you think this is obvious (more output is always better), remember more output means people working longer hours. If you think a zero output gap must be best, think about monopoly distortions or the impact of distortionary taxes. If a positive output gap is best, then a central bank may be tempted, once inflation expectations are formed, to try and temporarily raise output above the natural rate, knowing that the impact on inflation will be modest because inflation expectations are given. However rational agents will anticipate this, and the implication that their expectations about inflation will therefore be wrong. So they raise their inflation expectations above the central bank’s desired level, to a point at which the central bank no longer wants to raise inflation still further to get a positive output gap. The difference between this level of inflation and its desired level is inflation bias. Although there is a huge literature on this, I have never been that persuaded of it’s continuing relevance in a world of long standing independent central banks. Central bankers, or academics on the UK’s Monetary Policy Committee, know that it is foolish to try and go for a positive output gap in this way, so they will avoid doing so. If the public nevertheless thought otherwise and therefore set inflation expectations above desired levels, the central bank would not settle for the inflation bias equilibrium (the time consistent or discretionary equilibrium), but would deflate the economy to get inflation down. This would soon convince the public that it was not trying to achieve a positive output gap. Even if I’m right on this, we can still use the inflation bias argument in reverse. By this I mean that the public in ignorance will want the central bank to raise output above the natural rate, and the inflation target protects the central bank from this pressure. I mention this not because I think it is that convincing, but because this ‘using targets to protect the central bank from public pressure’ argument may have much more validity when we come to level targets. Of course the time inconsistency problem is more general than just inflation bias, but effects how the monetary authority responds to shocks (often called stabilisation bias), but here again levels targets may be more useful than inflation targets. I suspect the actual reason for inflation targets where they exist is more political. They increase the accountability of the central bank, and in some cases (like the UK) they allow politicians to set the target. These may be important advantages, particularly at the beginning of a new policy regime. I also suspect that many macroeconomists have traditionally assumed (as I did) that the costs of inflation targeting were small, because if that target was achieved flexibly, it was quite compatible with optimising some combination of inflation and the output gap. The reason is of course the Phillips curve, which says inflation cannot be stable in the medium to long term if the output gap is non-zero. So a regime that targeted some fixed inflation target over the medium term would automatically achieve a zero output gap over the same time horizon. Flexibility means leaving the choice of any particular short term combination of excess inflation and non-zero output gap up to the central bank. This rather sanguine attitude has been tested by recent events. Some countries have experienced a whole series of positive inflationary ‘shocks’, some of which just reflect fiscal policy decisions. In the UK this has exhausted any flexibility that the MPC may have felt they had in not meeting the inflation target, so that their plans now involve meeting that target (or, indeed, expecting to slightly undershooting it), even though they forecast a large negative output gap to persist. Aiming to achieve the inflation target conflicts with what a benevolent policymaker would do. In contrast, the Fed in the US has (albeit only recently) explicitly countenanced exceeding their desired inflation level in an effort to get the output gap down. In other words, the inflation target in the UK is stopping the MPC doing what the Fed signal they are prepared to do. As a result, monetary policy in the US is better than in the UK, as a direct result of the impact of the inflation target in the UK. A related problem is the measure of inflation used. As I have pointed out before, the CPI is particularly susceptible to inflationary shocks like tax changes or higher commodity prices. As it is not obvious what the correct measure of inflation is from a welfare point of view, focusing on a measure that over a period is persistently higher than others may be distorting policy. The more this bias is hard wired in through mandated targets, the more sub-optimal policy may become. So, my own view at the moment is that I prefer the flexible dual mandate approach in the US to the explicit inflation targeting regime in the UK. Now of course this view is predicated on US monetary policymakers being fairly close to the benevolent ideal. If instead policymakers without a mandated target acted as if they all they cared about was CPI inflation (as in the ECB, for example), the disadvantages of an inflation target fall away. Nevertheless, what my view implies is that – all other things equal – the case for a nominal GDP target relative to the current regime is rather stronger in the UK than it is in the US right now. A possible half way house has recently been suggested by Kate Barker, who was a member of the MPC, This would be to target a range (say 1%-3%), where the point chosen within that range by the MPC would depend on other factors, like the output gap. As I briefly listened to the radio the other morning, I heard the new head of the TUC (Trades Union Congress) talking about macroeconomic policy. She said the government’s policy of austerity has failed, and we need more investment in jobs. The interviewer asked whether this would mean more borrowing by the government. She avoided answering the question. Unfortunately I have heard exactly the same from many UK public figures who are critical of austerity. It is as if a memo has gone round with the following instruction: whatever you do, do not say your alternative policy will involve more government borrowing. The writer of this memo presumably thinks that the general public believes additional borrowing is bad, and so it is best to avoid any admission that a policy might require it, even if this borrowing is temporary and at very low interest rates. Following Polly Toynbee, the paradox of thrift is too paradoxical for the public. As some may have noticed, I have an unhealthy interest in macroeconomic spin. If you are concerned about policy you just cannot avoid it, and while it would be nice to pretend that spin does not matter, I suspect it would be a pretence. So, just on the level of spin, I cannot help feel that this fictional memo is ill conceived. Most people sense that when a public figure avoids answering a question, this is because they have something to hide. So in doing so, the effect is both to suggest that the policy will indeed require more borrowing, and that this is a problem, which is why the interviewee does not want to talk about it. Q: Wouldn’t this involve the government borrowing more? A: Yes, it would involve paying for the investment by borrowing. That is what a company would do if it saw a good investment opportunity, and we are always being told that the public sector should learn from good practice in the private sector. Q: Wasn’t it excessive borrowing that got us into this mess? A: Borrowing for a good reason is not a problem, as anyone with a mortgage will tell you. Borrowing becomes a problem when it underestimates the risks involved, and when the borrower may not be able to afford the repayments. The financial crisis was caused in part by excessive borrowing by consumers who thought house prices could never fall, but mainly it was banks over-extending themselves. The recession caused high government borrowing, and not the other way around. Q: But isn’t pubic sector borrowing at record levels? A: Yes, but so is the desire of the financial markets to buy public debt. This is why interest rates on public debt are so low. The financial markets desperately want to buy government debt, and so they are prepared to get very little back in return. That is one reason why now is just the right time for the government to borrow to invest. Q: The government tells us that if it borrows more we will become like Greece. A: This is nonsense. It is no coincidence that all the major countries experiencing a government debt crisis are in the Eurozone, because Eurozone countries do not have their own central bank. Governments outside the Eurozone have no problem borrowing at the moment – as I said interest rates outside the Eurozone are at record lows. If there was a serious risk that the UK would become like Greece, interest rates would not be so low. Q: Isn’t it wrong for the government to be borrowing more when consumers are so strapped for cash, and often cannot borrow or are trying to rebuild their savings? A: Exactly the opposite is true, as any economics student will tell you. If consumers are saving more, there is less spending power in the economy. If the government also spends less, we get a recession. That is the basic mistake the government is making. This is the other reason, besides low interest rates, why now is just the right time for the government to borrow more. In a recession, there is no danger that government spending will crowd out private spending, and it is much more likely to stimulate the economy. Q: But surely no government can keep on borrowing more forever. A: Of course not. But the right time to cut government borrowing is when the economy is strong, and the cost of borrowing is high. Q: All politicians will find an excuse to spend more or tax less, and put off the day that borrowing is brought under control. At least this government has had the courage to deal with the problem, unlike their predecessors. A: As many countries besides the UK are finding, it is much more difficult to bring down borrowing when the economy is weak. By contrast, many governments have succeeded in reducing borrowing when the economy has been stronger. Before the financial crisis, the ratio of government debt to GDP in the UK was below the level when Labour came into office in 1997. Bill Clinton successfully reduced US government debt during the 1990s, when the US economy was growing strongly. Q: But government borrowing more now will inevitably mean higher taxes in the future. We should not burden future generations in this way. A: Not necessarily. By spending more today, we can reduce the need for the government to spend in the future, so taxes need not rise. As far as future generations are concerned, I suggest you ask some of the nearly one million young people who are currently trying to find a job what they think. OK, I have written a fair number of published DSGE papers on fiscal policy over the last decade, so here is my response. New Keynesian theory, and therefore the New Neoclassical synthesis, provides pretty clear answers to the multiplier question. I have talked about this before so I will not repeat these answers here. Macroeconomic theory is ‘all over the place’ on many issues, but this is not one of them. I would go further. If policymakers had paid more attention to theory, and less to a well known piece of empirical work, they would have been less likely to have made the mistakes they have. The problem is not ambivalent theory, but the fact that a large section of macroeconomists choose to ignore or discount the relevant theory. Now this is actually consistent with the sentence from John Quiggin’s post that I quote above, because of the part that says ‘at least ....’. So in that sense it is a quibble. But I think it is an important quibble. There is a great deal of difference between suggesting that theory is all over the place, and saying that a large body of theory – the theory used by nearly all monetary policymakers – is pretty clear, but that a significant group of economists do not accept it. The difference comes in the following paragraph, where he says “It really is hard for me to see how the economics profession can recover from its current rotten state, at least as regards macro..” If a large section of the profession (perhaps even a majority) subscribes to the New Neoclassical synthesis framework, and that framework is sound (if far from perfect), then we still have a problem, but one that does have solutions. Did Ricardian Equivalence kill the Pigou effect?